So we've got a bonus room for hanging out and playing games. It’s made up of a few different sections that open up to each other. The kitchen area perfect for mixing up drinks. 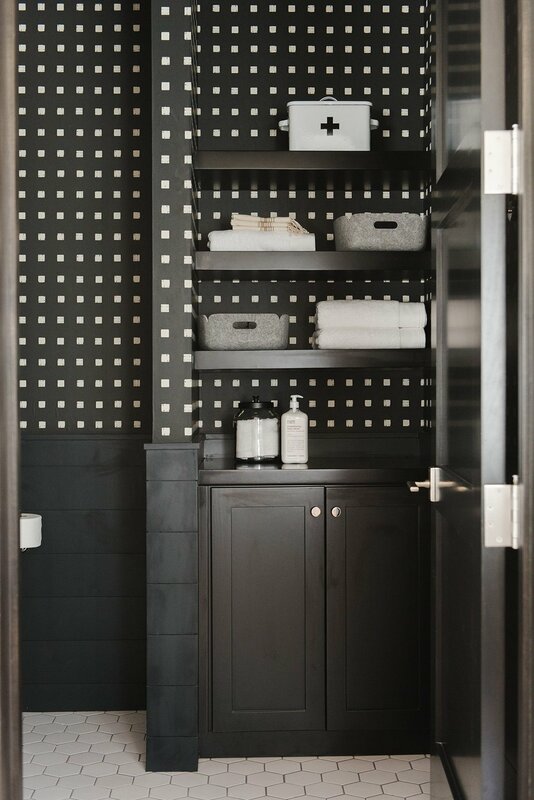 You’ve heard us say that the main color combination in the house is black, white and, wood. In the kitchen area we did that same color palette but in a completely new way! 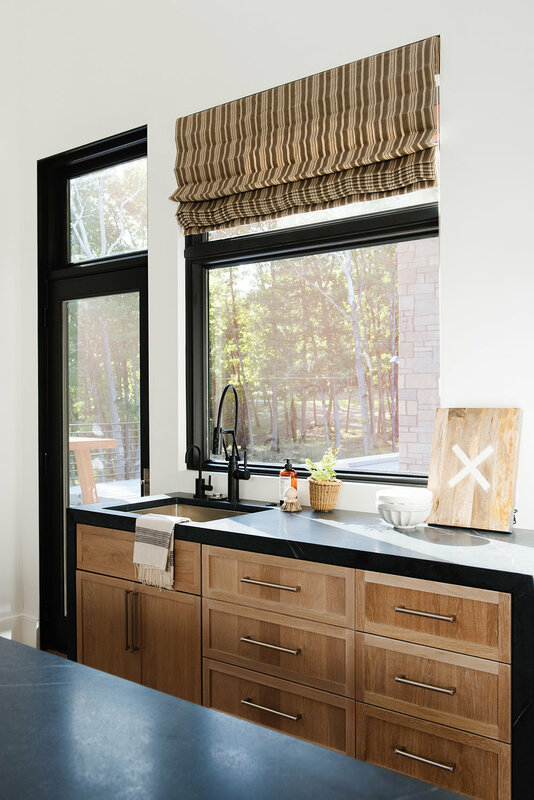 We started with wood tone cabinets and then paired them with dark counter tops. You’ll notice the waterfall detail is not just on the island, but on the outer cabinets as well. The TV lounge area was actually kind of awkward to design! There were a lot of interesting angles and no straight lines. So we had to try a variety of different furniture layouts. If your home is full of weird angles, it’s smart to start with a coffee table and design around that. This Grady Coffee table is so great, Shea has it in her own home. We love the storage space on the bottom of the table. We’ll throw a basket under there to store games, blankets, or random kids’ toys. It’s a great way to create a pathway and hide things. And don’t miss the framed antique flag! We love how it takes up a good amount of wall space and adds warm, interesting character that we just can’t live without. You enter the rest of this wing by walking down this long hallway. 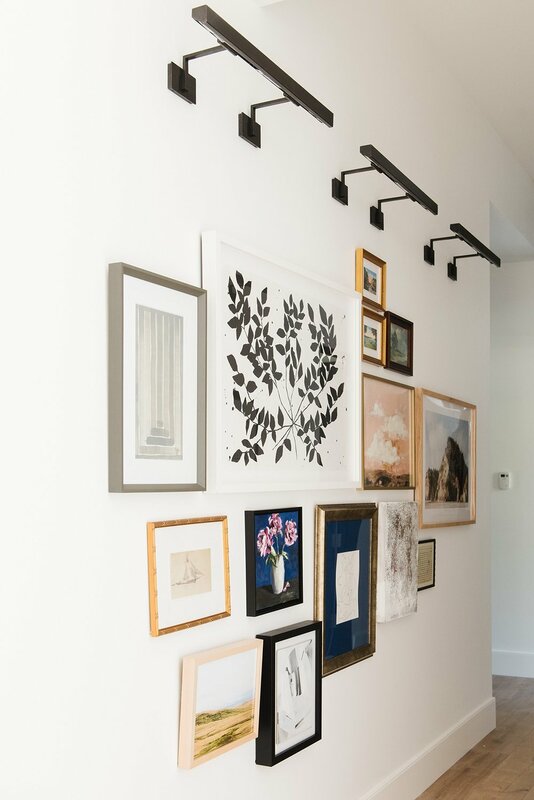 It doesn’t have any room for furniture, so we went big by doing a large, eclectic gallery wall. We used a mix of new and vintage art and frames, so there was a unique, collected feel to the creation. The library lights on both sides make the gallery feel elevated and special. This bedroom was designed for our clients’ son. He loves fishing and couldn’t imagine using anything else to hang above the bed. He actually caught the fish himself! This may not be a piece of decor for everyone, but we totally love something that brings personality to the room. The color palette in the fish happened to work perfectly! It brought out creams, natural browns, and greens in the space. This dresser vignette turned out so beautifully. 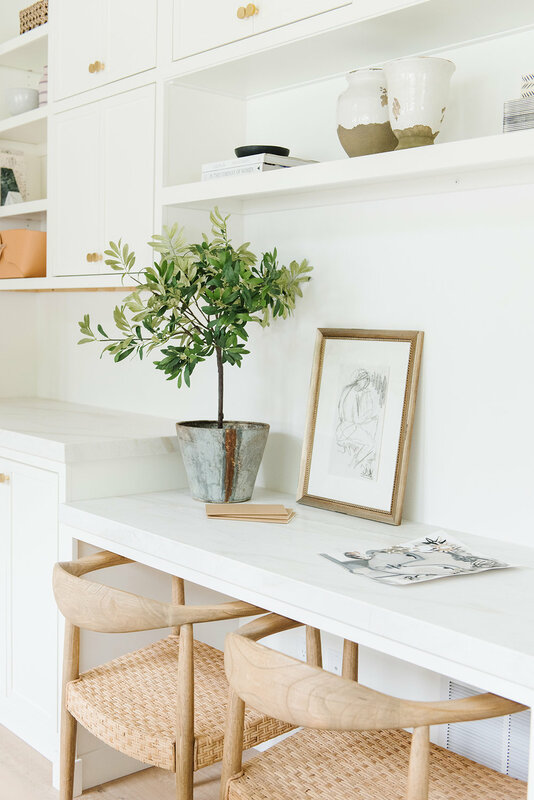 I love this dresser because it doesn’t have any hardware, and just looks so pretty with its white wash and rustic-meets-modern vibe. We incorporated a really cool mirror with brass details and a shapely green lamp. 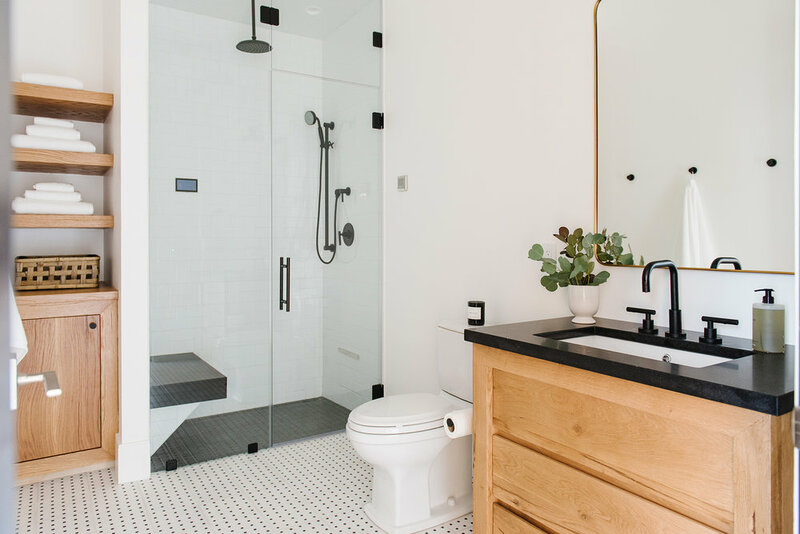 It’s hard to pick something not to love about the bathroom. 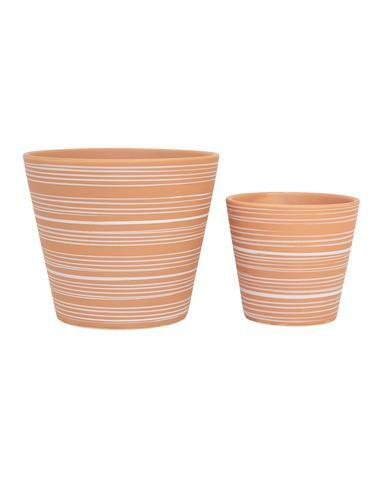 From the tile on the floor to the painted terracotta with a cool shape and little stripe. And you know how we feel about stripes! The color on the vanity is amazing, and the black free standing tub is complete by the abstract art and pendant. The bedroom for our clients second son is really cool. We started with the painted stripe detail on the wall before anything else. It adds depth and interest against the neutral pieces in the rest of the space––like the pretty artwork and the hand-knotted rug. The sconces really elevate the space. 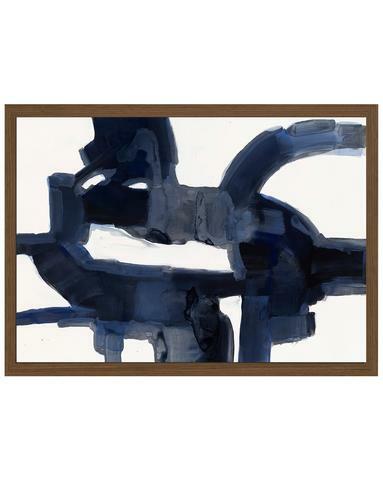 This landscape piece brings a beachy element to the space, coordinating with the coastal painted detail. This nightstand brings out all the dark touches in the space, and the handles add to the beachy, modern feel. The dresser across the room has a pretty wood tone contrasting against it’s dark color and round shape of the mirror. The stacked lamp in this space is one of our favorites. 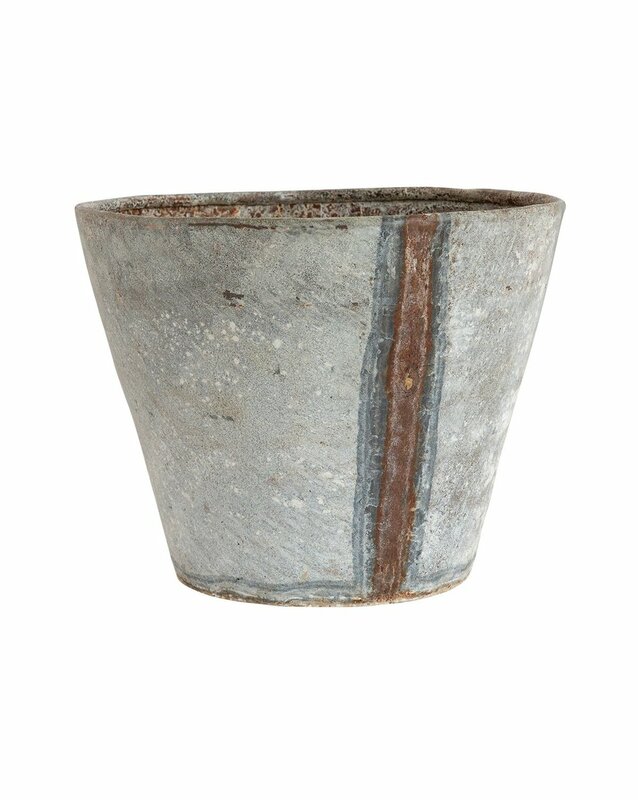 It’s cool, textural, and has a pretty off-white finish. The bathroom off of this bedroom had to be just as cool, so we started with cool tile and a custom vanity of course. We chose a thick countertop and no hardware to match the dressers in the bedrooms. Next up is the most feminine room in the whole house. The request was a lot of white and gold, with touches of pink. We brought in the style of the rest of the home by using a cool four post bed, and layering beautiful linens. The bed is completed by a body pillow. This one is another one of Shea’s favorites, it anchors the bed and is great to cuddle up to as you fall asleep. The linen that wraps this nightstand makes it a timeless piece, for such a soothing, calm beautiful space. Onto the bathroom! We have a beautiful marble mosaic on the floor. We used one with large scale where the white really comes out. It has warmth to it that ties in with the huge light fixture. We brought out the pink tones from the bedroom with the vintage rug. 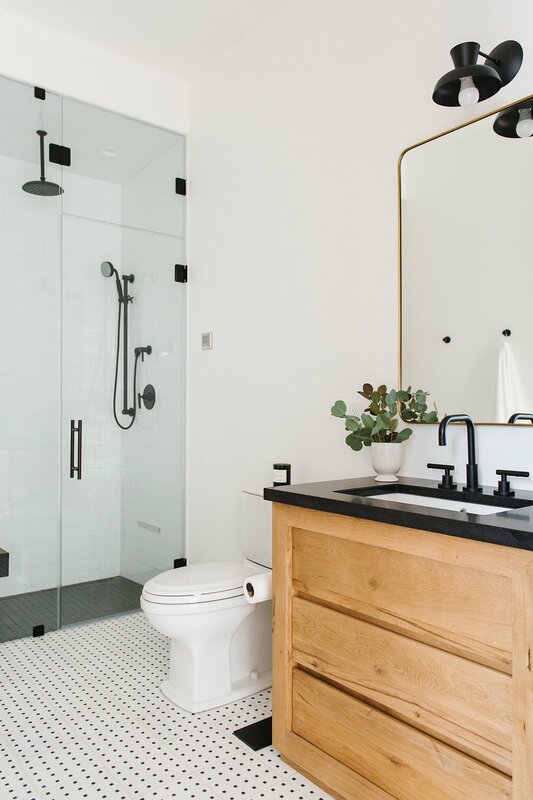 Our Mill Globe Lantern is the definition of statement, and it looks so elegant hanging above the exposed tub. 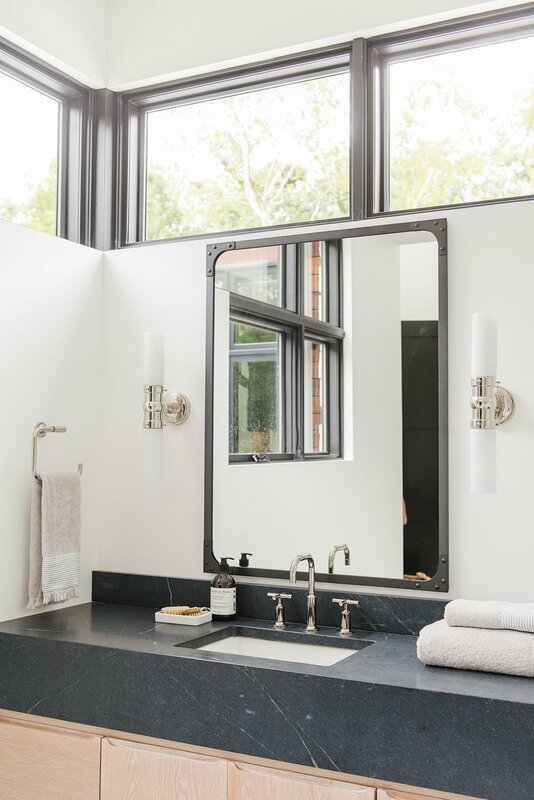 The mirror and sconces bring that feminine edge to the space, with the lucite detail on the bottom of the sconces and the curved edge on the gold mirror. This home gym is simply insane. Almost anyone would dream of having a gym like this one. 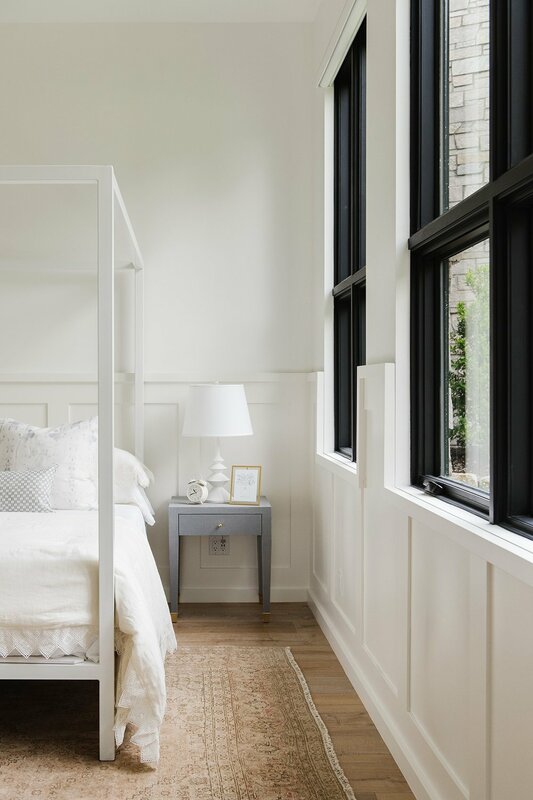 There’s stunning wood paneling everywhere, pairing nicely with the black windows in the entire home. We could’ve put in a rubber floor and that would’ve been fine. But this house is next level so we used a designer cement pattern floor right in front of the kitchen. 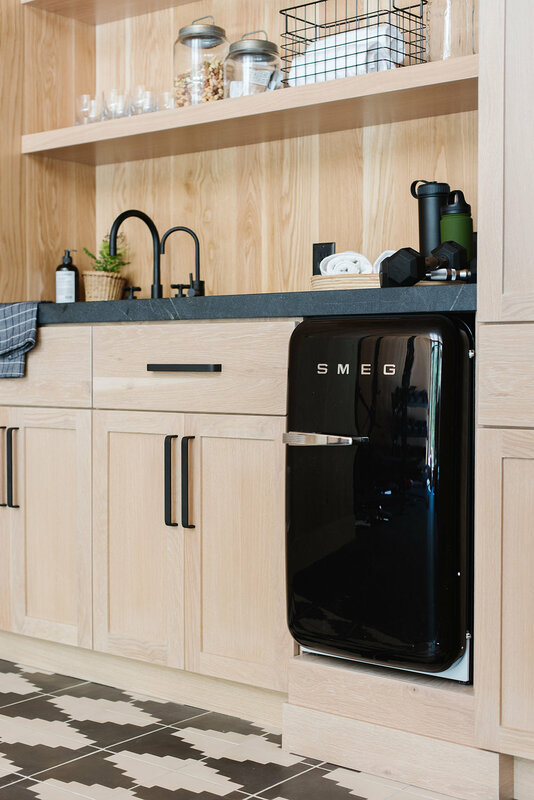 Another black detail is the darling smeg fridge. 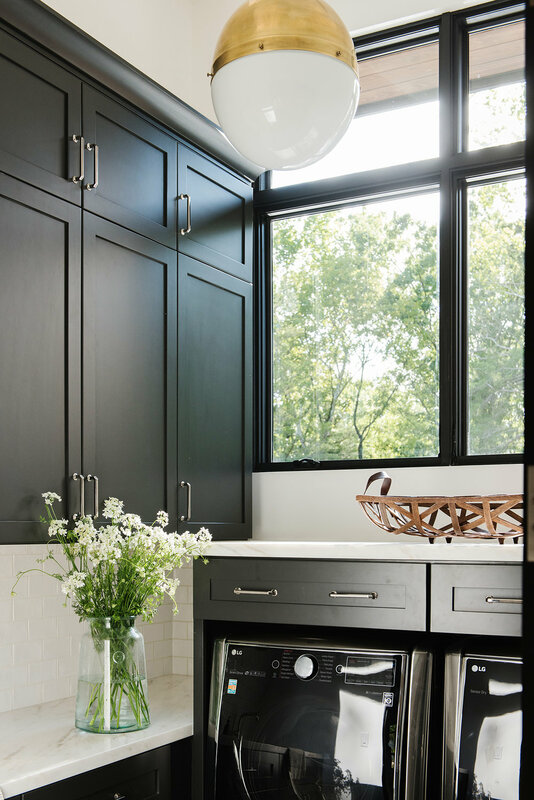 People don't always think to do a dark cabinet in a laundry room, because they want the space to feel light and airy. But a dark cabinet doesn’t ruin that! We went with a lighter backsplash, a patterned floor, and a really pretty gold pendant. Last, but certainly not least is our favorite room in the entire home. This craft room is an actual dream come true. In the craft room, we designed a beautiful floating island with pendants hanging from a vaulted ceiling. Natural light fills the space and brings it to life, perfect for inspiring beautiful creations. We could go on and on about this space! There’s a sink, which is super convenient, and built-ins everywhere! Stay tuned for our next project! If you love this one, you’ll be excited about the next. 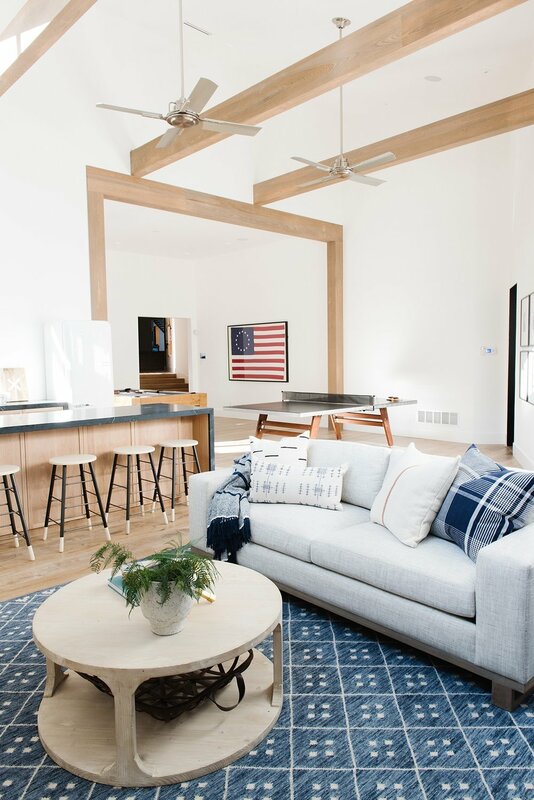 You can get caught up with the rest of the home by watching the first webisode, and touring the Living Room, Kitchen + Nook, and Entry + Dining Room. Then check out the second webisode and photo tour.